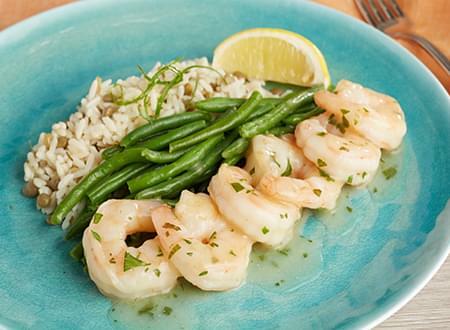 Savor our delicious shrimp Scampi, sautéed plump shrimp in a sauce of fresh squeezed lemon juice, unsalted butter, white wine, chopped garlic, and chopped parsley. SHRIMP, WATER, PREMIER CHICKEN BASE, LEMON JUICE, WHITE WINE, BUTTER,GARLIC, ULTRA SPERCE MAIZE, PARSLEY, GARLIC POWDER, BLACK PEPPER. Remove Shrimp from tray and heat reamaining part of the meal in microwave according to label instructions for 2:00 minutes. Check temperature and heat in additional 30 second increments until at least 160 degrees. In a separate dish or during the remaining 45 seconds of heating the rest of the meal heat shrimp for just 45 seconds until just hot. Over cooking shrimp will make them tough.